As well as co-ordinating annual Spring Cleans, we supply equipment and guidance for people who want to carry out litter picks at any time of the year. 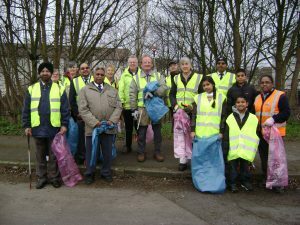 The more people that we know are carrying out litter picks the stronger our voice when lobbying for a cleaner Oxford. So please register as a group or register as an indvidual. Below are some guidelines and suggestions to help you organise a litter pick at times other than OxClean Spring Cleans. You might also like to sign up to PAL – People Against Litter – and commit to pick up just one piece of litter a week! Keep Britain Tidy has lots of useful advice and tips about planning a litter pick. These include Health and & Safety guidelines. Their guide to organising a Litter Pick can be found on our Essential Information page. We have a large stock of litter pickers and OxClean Hi Vis vests that we lend to Oxford-based people whenever they want them. Click here for requests and enquiries. The City Council is keen to support litter picks. They will supply empty sacks and pick up filled ones. Email streetscene@oxford.gov.uk to make a request – or call 01865 249811 and talk to Streetscene. If you are organising a group, here are some tips about recruiting volunteers to join your group including downloadable posters and leaflets – recruiting volunteers. If you are organising a group, make sure your volunteers are well briefed. When they enlist, give them a ‘Keep It Safe’ leaflet. On the day, hold a short face to face briefing – download a ‘Sign In’ sheet. Include health & safety issues including dangerous items that should not be picked and how to contact you. Needles, syringes, hazardous waste should not be picked – report immediately to the City Council using their help line 01865 249811 and selecting the Street Scene & Emergency option.